In terms of operation speed, ergonomics, image quality and build quality, the EOS 7D is a wonderful new device within Canon’s range of APS-C DSLRs. The EOS 7D is definitely a step up from the EOS 50D. That is because the Canon EOS7D is capable of shooting eight frames per second while shooting continuously, and also because of the amazing and flexible auto-focus capabilities. All of the various components and functions contained in this device make it one of the best APS-C DSLRs available in the market today. Cannon’s EOS 60Da is a version of the 60D DSLR that is meant to be used for astrophotography, and uses a infra-red filter which increases the camera’s sensitivity to 656nm emission frequency for hydrogen which as you likely know is essential for anyone who wishes to take photographs of nebulae (gaseous clouds) in outer space. The camera is also 18 mega pixels which is a great upgrade from the 2005 20Da which had only 8 mega pixels. Canon’s Rebel T4i/EOS 650D are DSLR with 18 mega pixels and a touch screen display. It has an auto focus system that uses a sensor system to deliver great focus for both the live view and the movie mode. It also has an all-cross autofocus sensor which enables it to shoot 5 frames per second. It also has a stereo mic that can be used in Full HD video recording at either 24fps, 25fps or 30fps. The 60D has the same sensor as the 7D. The t4i utilizes a Hybrid CMOS sensor that has pixels that are designed to help out in autofocus and in phase detection. The autofocus used in the 7D is more advanced than any in the rebels, even beating out the T4i. 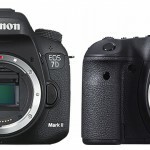 The 7D has top of the line weather sealing, autofocus, build quality and a truly first rate viewfinder. There are some advantages to the t4i as well. For photography, it performs much below what you can expect from the 6D and 7D, but for shooting video the t4i is preferable. It is better than its former versions for photography as well, and you can use the Live View feature with manual focus lenses. In addition, it has great autofocus, 18 mega pixel display and up to 25600 iso. It is also better in low light conditions when shooing images, and the touch screen isn’t bad either. If you are looking for a great touch screen and lots of options for shooting video, the T4i is a good choice. If you are going to be using your camera for sports photography, the 7D may be the best choice due to the burst rate and the high quality autofocus. If video is not that important to you and still imaging is more important, you should probably go for the 7D. The 60D is better for photographs than the T4i is, but not as good as the T4i for shooting videos. So get the 6D if you are working with a limited budget but wish for a decent device for shooting videos that still has great autofocus and burst rate for shooting photographs. Next How to choose a Best DSLR Camera for Beginners?